This was a weekend that our team was tasked with extending our creative programming muscles into one of the most vital aspects of our church… our Reach Missions. This is an annual weekend emphasis each January at The Crossing and it left us with a dilemma. There was nothing in our current series or the weekend theme (Are We Living in the End Times?) that directly related to the mobilization and movement of people beyond our comfortable life into a collision with the rest of the world. So we made the decision to create a smooth, but clear line of demarcation. Let’s pause here and address a key concept for creatives. One of our core values as a church is to always be catalyzing movement within people. This is a combination of spiritual and practical steps. Each weekend our hope is that we will grab the spiritual attention of our church, present a clear biblical perspective and then catalyze movement on their part. Sometimes it is a move spiritually (re-commit to a spiritual discipline, confess sin, etc.) and other times it is more practical as they discover their next spiritual step and act upon it in some way by engaging in an active way (often by signing up, register or joining something ). If a moment in a worship service, catalyzes movement on the part of the individual towards God, then we are meeting our objective. So with that in mind, we used the communion moment post-message to shift the tone. This is important. When you are going to make such a potentially abrupt shift, look for a transition moment that eases the shock and sets up the move. For us, communion naturally provides that shift as people are contemplative and it generally puts a reflective period on the message. Following communion, we introduced our Reach initiatives for 2016 with the stories of individuals who had traveled to another country for the first time in 2015. These were recorded 6 months earlier and worked perfectly for this moment when combined with appropriate b-roll. Note: If you constantly find yourself saying, “I WISH we had footage of _________”, begin taking the approach that EVERYTHING has potential for a future story and if you have the means…capture it. Keeping those moments in the video vault will often be extremely valuable in these type of moments. If your video team can lean into this and organize these archives effectively it will pay huge dividends. Local outreach partners from our community available to interact and provide information on potential service projects. An interactive replication of our Mexico Home Build homes which included “text to learn more” options for each upcoming Global Reach Trip. A simple text with the key word of the country the individual was interested in would reply with a link to a short video from each trip leader giving info and encouraging them to participate. Information Center for all of these trips. The moment concluded with the song Invitation Fountain and our Guest Services team distributed Prayer Bands that each contained one of our 40 individual partners. The bands were distributed during the song rather than at the doors to tie them directly to the moment and encourage individual response. The song was also backed with a video loop containing highlight pics from the past years Reach missions experiences. At our conclusion, they were then encouraged to head out to the interactive area. The home is a replication of what is built in Baja Mexico in our regular partnership with Youth With A Mission. Volunteers spent Saturday prepping the house to a point and we then had volunteers on site throughout our services painting, roofing, etc to interact with people. Tons of work. Totally worth it. If something doesn’t naturally fit in your normal service flow, give real intentional thought as to how to best transition into that moment with the least amount of disruption. Transitions matter. (Repeat that) Transitions matter. Pay attention to them. Visuals and interactive experiences are always a great enhancement to any presentation. Look for ways to infuse them in these moments. Look for opportunities for your theme AND your creativity to extend outside the walls of your auditorium. Constantly ask the question ….how can we EXTEND IT? We kicked off a new 5-week series to open the New Year. We choose to go in a bit of a different direction, but based on our sense of where we were as a church and as a culture, we went for it. Little did we know how difficult a series like this would be to ACTUALLY create worship experiences around those topics. 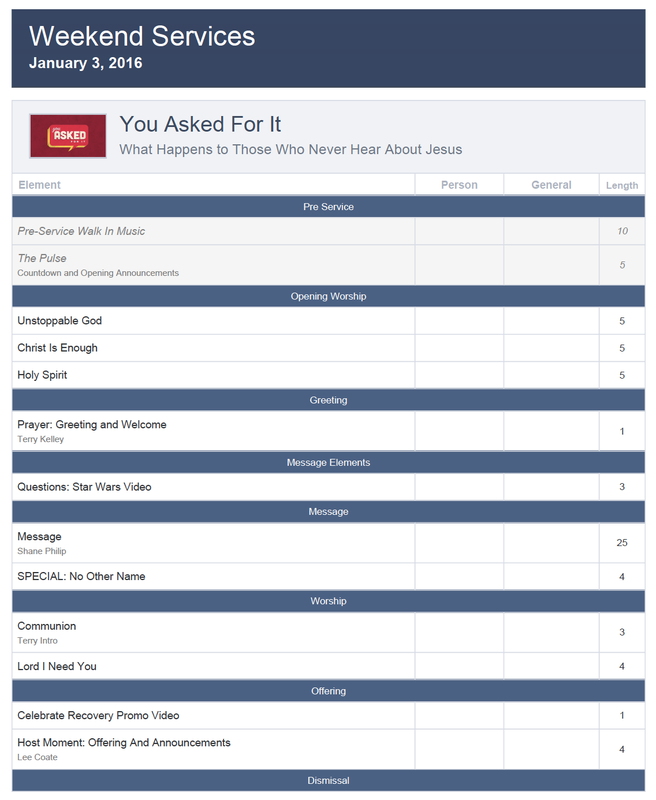 A survey was sent out in early December with 30 potential questions people may have for God. We asked hundreds of to choose the Top 5 Questions they would like to ask God. Throughout the month of January we will be working through them from #5 – #1. We are not revealing them beforehand, but moving through them one by one. Today’s question was “What about those who have never heard about Jesus?” We choose to focus on setting up the series as a pre-message moment. In the midst of Star Wars mania, we used a Youtube clip as a father shows his son the original Star Wars for the first time and the viewing is filled with questions. We clipped the video and added setup text at beginning front and our series logo at the end. The conclusion of the message pointed people towards the truth that most important thing was what they do with what they know about Jesus. We capped the song off with a post-message song from Hillsongs “No Other Name”. The band did an acoustic version of the song and used a lyric loop with environments to accompany the song. This would be an example of what we call “the last 10%”. Song was solid as it was, but our intent was to discover simple, subtle ways for the song to move on people’s hearts at a deeper level. Even though we have done the song as a regular part of worship in the past, by reshaping the presentation it took on new life. It’s something we have constant conversations around. Note: We did radio version. Lyric video is set to 74 bpm on click.